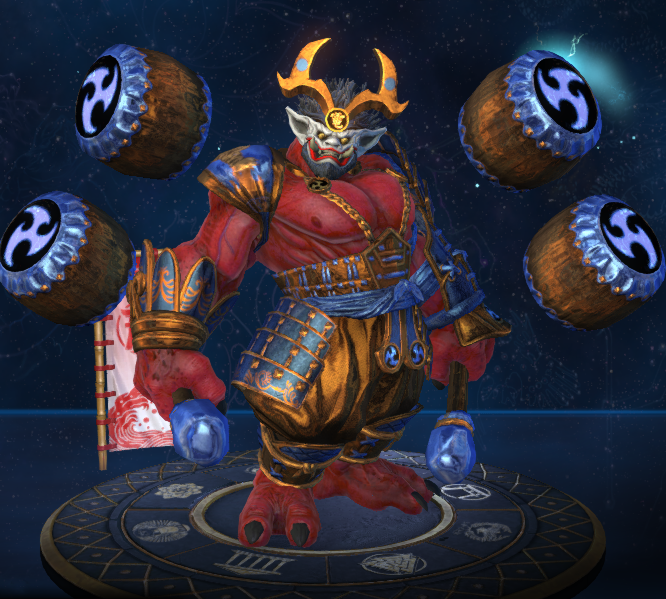 Raijin is one of the playable Gods in SMITE. Thunder is a terrifying element, trembling the very earth with its sound. Herald to storms, accomplice to lightning, thunder is primal, powerful and chaotic. Let this speak, then, of its master, the demon faced God, Raijin, who summons this force with the pounding of his great drums. Has a shot radius of 4.5. Has a projectile speed of 115. Can deal up to 100/160/220/280/340 (+120% of your magical power) damage. Reveals stealthed targets for the duration. Raijin becomes briefly untargetable while in the sky. Deals a total of 60/75/90/105/120 (+40% of your magical power) damage. Beat two: Taunt and 30% Damage. Beat three: Fear and 30% Damage. 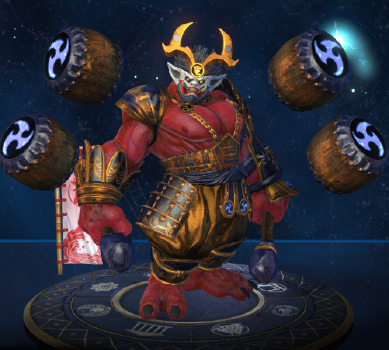 While in the air, Raijin suffers a 20% Movement Speed Slow. Has a projectile speed of 100. Will end as soon as the 4 peals have been used or after 7s have passed, whatever comes first. One of Raijin's lines for placing wards, "I will look for you. I will find you. And I will kill you. ", is a quote from the movie Taken. Raijin's Defeat Screen animation is a reference to a scene from the movie Whiplash. Raijin's face in this skin is a reference to the Rock band Kiss. This skin shares its theme with Cherrybomb Sol and Heavy Metal Thor. 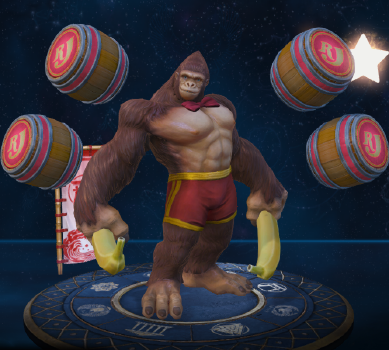 This skin was based on the classic arcade game Donkey Kong. The name of the skin was based on the internet meme that came with the Killing of Harambe. This skin's VP is one of the few VPs entirely made with grunts along Jurassic/Terror-Dactyl Camazotz. 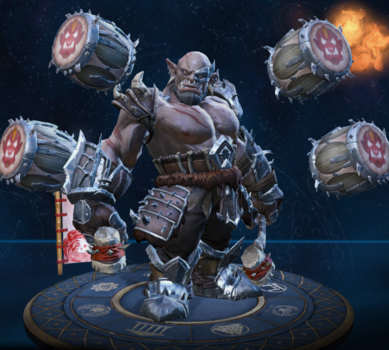 This skin is based on the Uruk-hai from the book series Lord of the Rings. 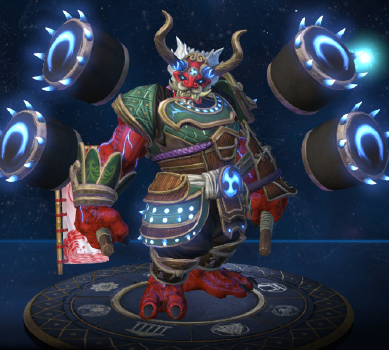 This skin shares it's theme with Hou Ru Kai Hou Yi. This skin was part of the Odyssey 2018 event. Reduced Base Damage from 30/45/60/75/90 to 25/40/55/70/85 per shot. (120/180/240/300/360 to 100/160/220/280/340 total). Reduced damage to targets beyond the first to from 15/25/35/45/55 +13% scaling to 9/15/21/27/33 + 8% scaling per tick. Increased Cooldown from 90s to 100s. Reduced Radius of Projectiles from 6 units to 4.5 units. Updated the targeter visual FX to better convey the overlapping area for the projectiles on the double shot. Players hit by Raiju will now have the hit visual FX travel to their god more quickly. Fixed an issue where the ground hit visual FX would not display when a target was successfully hit. Fixed an issue where all targets inside Raiju's targeter would be highlighted, rather than just the target closest to the center. Percussive Storm projectiles now have a radius of 6 units at all times, increased from 4.5 at maximum range. They no longer scale in size. Decreased Base Damage from 35/50/65/80/95 to 30/45/60/75/90. Increased projectile speed by ~20%. Players will now be able to move during the warm up of Thunder Crash. Added additional support to limit the times players can become stuck, unable to cast any shots of Taiko Drums. Increased Cooldown Reduction from 1s → 2s. Percussive Storm now pierces enemy gods. Decreased self Slow from 40% → 20%. Adjusted first two shots to now travel down the center of the Targeter. Adjusted the last two shots to be closer to the center of the Targeter. Increased Shot Radius from 3 → 4.5. Increased Range from 65 → 70. Increased Damage for from 25/40/55/70/85 → 35/50/65/80/95 per Shot. Decreased Scaling from 30% → 25% per Shot. Decreased Cost from 80/85/90/95/100 → 50/55/60/65/70. Now deals its Damage over time. Increased Damage from a flat 60/100/140/180/220 → 15/25/35/45/55 every .5s for 2.5s. Reduced Scaling from a flat 70% → 13% every .5s for 2.5s (total of 65%). Now applies a 15% Slow to marked targets. When Raiju is triggered the Slow and Damage are spread to nearby allies. The Slow is increased by 15% on the marked target for a 30% Slow. Decreased Cost from 70/75/80/85/90 → 60/65/70/75/80. Decreased Cooldown from 18s at all ranks → 16/15/14/13/12. Is now targetable until he fades away to his new location. Improved sounds and visuals to better distinguish which drum is being fired. Projectile speed reduced from 120/s → 100/s. Increased Fire Duration from 4.5s → 7s. Reduced the Damage on Beat Two (Taunt) and Three (Fear) from 50% → 30%. Fixed an issue where Raijin's passive would not be correctly consumed by Raiju. Reduced Damage from 80/125/170/215/260 → 60/100/140/180/220. Reducing scaling on Thunder damage from 40% → 20%. Increased base Magical Protection from 25 → 30. Lightning Damage reduced from 20/30/40/50/60 → 20/25/30/35/40. Thunder Damage reduced from 40/60/80/100/120 → 40/50/60/70/80. 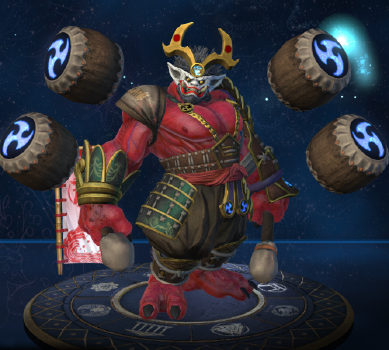 Fixed an issue where some circumstances caused Raijin's ultimate to deal an incorrect amount of damage. Increased projectile speed from 100 → 115. Fixed an issue where this ability would not stop upon being silenced. 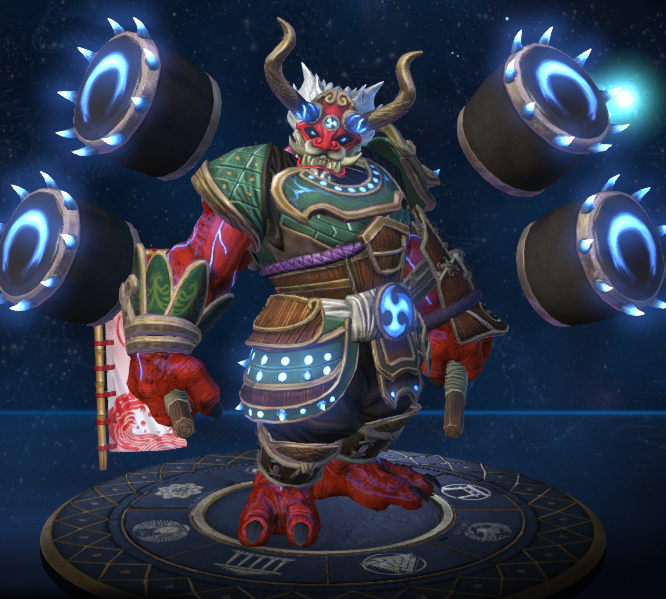 Raijin will no longer be able to be stunned/silenced/etc. once he has become invisible. Time in air increased from 3s → 4.5s. Reduce movement penalty from 75% → 40%. 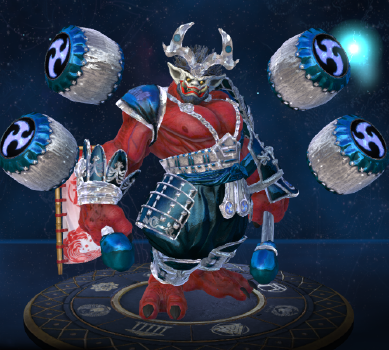 Fixed Raijin applying 2 procs of Soul Reaver with this ability under special conditions. Added achievements ‘Drums In The Distance’ and ‘Go My Friend’. Raijin has been added to the game. Increased maximum number of targets from 4 to 5. Raijin's drums gather static charges as he fires Basic Attacks and Abilities. When all four drums are charged, his next Ability does additional damage. Basic Attacks grant one Charge. 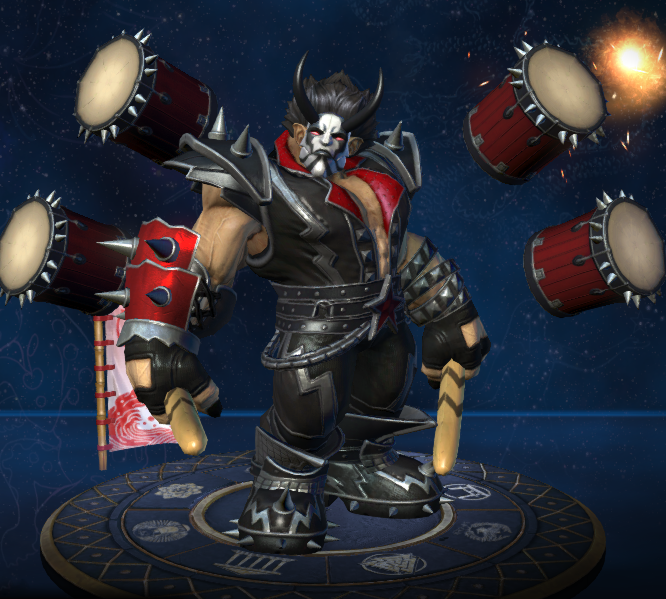 Basic attacks and abilities do not need to hit a target to charge the drums. "Basic Attack Power" refers to the damage dealt with basic attacks. This page was last edited on 8 March 2019, at 15:06.